Sauce and topping an easy way to dress up vegetables! 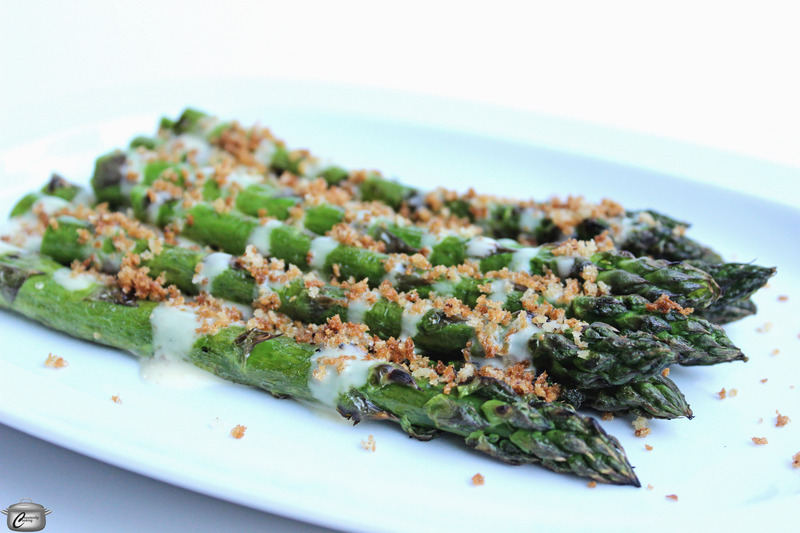 Every year it seems I feel compelled to come up with yet another grilled asparagus recipe. Some of my favourite creations feature asparagus with za’atar and creamy harissa sauce or snuggled up with grilled spring onions or dressed up with an Asian-inspired marinade. I just love asparagus season so much I can’t stop thinking of new ways to enjoy it! As for this new recipe, I’ll definitely be making it again and again and will likely adapt it for other grilled vegetables as well, including leeks. It’s super speedy to prepare and you can easily use your favourite vegan mayonnaise. One of the things I like most about it is that it can be served warm or at room temperature, making it a perfect dish for easy spring and summer entertaining. Preheat grill to medium (approximately 350F). Alternatively, you can broil the asparagus or sear in a cast iron pan, turning often. While grill heats, rinse the asparagus under cool running water and snap off the woody ends (here’s a video in case you don’t know what I’m talking about). Place the asparagus on a baking tray and drizzle with just enough olive oil to lightly coat, tossing with your fingers. Sprinkle with salt and pepper. Whisk together sauce ingredients; taste and adjust seasoning. Set aside. For topping, heat olive oil in a small frying pan over medium heat. Add panko and stir to coat with oil then stir constantly for a few minutes until it is evenly toasted. Transfer toasted panko to a small bowl and set aside. Grill asparagus, turning often, for about 5 – 7 minutes, until just tender. More slender spears will cook quickly, so watch them carefully. Arrange cooked asparagus on a serving platter. Drizzle with sauce then sprinkle toasted panko over top. 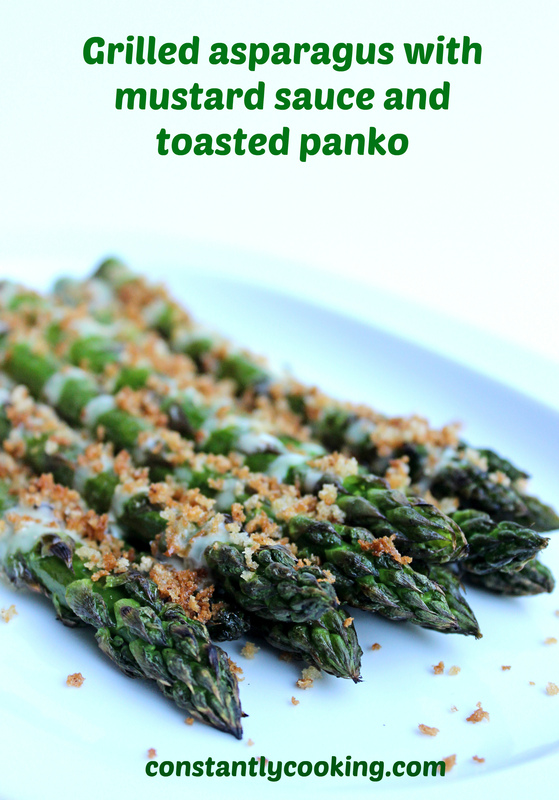 This entry was posted in barbeque, Grilling, vegan, Vegetables, vegetarian and tagged asparagus, dijon, grilled asparagus, Maille, mustard, olive oil, panko, Paula Roy, sauce for asparagus, summer entertaining, vegan side dishes, vegetable side dishes, vegetarian side dishes. Bookmark the permalink.